Home > How wide is our welcome? 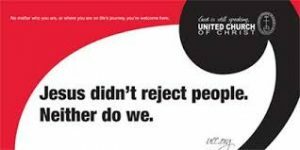 Henrietta United Church of Christ is a diverse and welcoming Christian community. Rooted in Christ and guided by the Holy Spirit, we seek to reflect and embody Jesus’ love for all people and all creation, as we…create a safe community for all, regardless of ability, race, age, gender, sexual orientation, or means. This statement isn’t just words to us. It is the foundation of a community based on the example of God’s amazing grace and Christ’s unconditional love. It is rocking chairs in the sanctuary for parents of restless babies, a nursery with two caring attendants, and the frequent inclusion of children and youth in our worship service. It is ramped entrances, a wheelchair lift, cut-down pews to accommodate wheelchairs near the front, a coil induction hearing loop, fully-accessible restrooms, and ushers helping people park their walkers. It is gluten-free communion that is open to all. It is a full welcome of all kinds of family constellations. It is being an Open and Affirming congregation that provides a place of safety and welcome for sexual minorities. It is our sermons that preach about the boundless love of God for all of God’s children. To include everyone, regardless of who they are, makes us living channels of that unfathomable love. To welcome those who have often been excluded or condemned follows the transforming example of Christ. And embodying God’s amazing grace for each other helps liberate us from our limiting judgments of ourselves and others so that we can live in the grace that sets us free to.